It is possible to configure any graphical object to write new values to the PLC (or database). The ability to toggle a specified bit, write a static predefined value, write any value given by the user, or write any value given from multiple choices from a user-created list are all possible. There are three types of triggers available for each object, and each of them can write its own dataset. The data can be written using the on Click, on Up, and on Down actions. The on Up and on Down triggers are independent, so you can write two different sets of data with one button at the same time. All three triggers have the same properties. 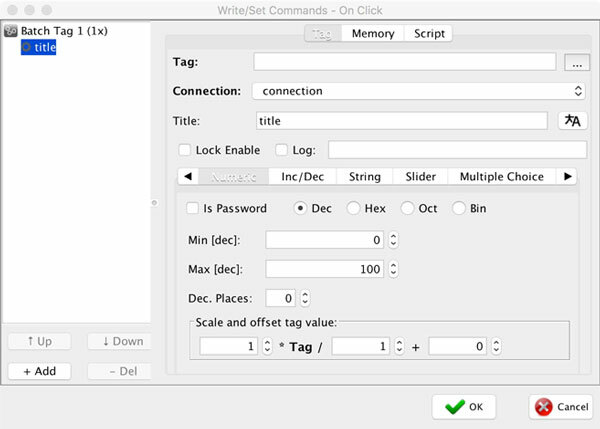 To use a write/set command, please select the graphical object you want to use for the set/write command and then navigate to Properties -> Write/Set command. The dialog window is split into two sections. On the left, there is a Tree View showing all of your set commands in hierarchical order; the right section shows the parameters of the selected set command.